1. What was Satan's sin that caused him to be cast down from heaven? a. The temptation of Eve. b. Pride in his beauty. c. The temptation of Jesus. d. Pride in his status as God's anointed cherub. 2. What does the Greek term "diabolos" mean? d. Ruler of this world. 3. What does the Hebrew term sātān mean? 4. When was Satan created? a. Day 1 of Creation. b. Day 3 of Creation. c. Day 6 of Creation. d. Sometime after the first 6 days of Creation. 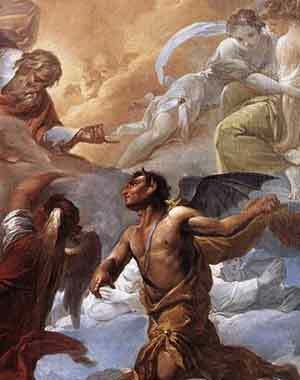 Who and What are Fallen Angels?